The Vahinala Project aims to assimilate information on all native and naturalized vascular plant species in Madagascar, evaluating the available taxonomic literature and specimen base for each taxon. The primary result of the project is the Catalogue of the Plants of Madagascar, an online database. The Missouri Botanical Garden leads the Project in collaboration with numerous institutional and individual partners. We completed a synonymized list of accepted species in 2008 and in 2012 we have completed the taxonomic evaluation of the majority of all genera and compiled distributional, ecological, and conservation status information for most well-circumscribed accepted species (View Project Milestones). In 2017 we added a preliminary checklist of bryophyte species, and changed the name of the website from the Catalogue of Vascular Plants of Madagascar to it's current name. Using the Madagascar Catalogue (MadCat) - The pale green horizontal Menu Bar provides access to basic search functions and standard TROPICOS links, while links on the pale green vertical Navigation Bar provides links to data browsing options, and to advance search options. A quick search for any plant name can most conveniently be made from the Taxon Name box on the Navigation Bar. The 'Search Builder' generates species lists based on multiple project attributes including a keyword search on a taxon name, thus generating a list restricted to a certain family or genus by specifying this name in the Keyword search box. Image Search accesses all images on TROPICOS, while the Project Query Builder is available only to logged-in users (Project Login access is normally only provided to project personnel and contributors). On most pages in the upper right corner the words 'Choose Project' appear, providing links that enable the user to switch between a Madagascar Catalogue Project view and a standard TROPICOS view, or to the corresponding page in other TROPICOS Projects. Click on the Catalogue of the Plants of Madagascar header at any time to return to the Project Homepage. Madagascar Catalogue, . Catalogue of the Vascular Plants of Madagascar. Missouri Botanical Garden, St. Louis, U.S.A. & Antananarivo, Madagascar [http://www.tropicos.org/Project/Madagascar. Accessed: , ]. 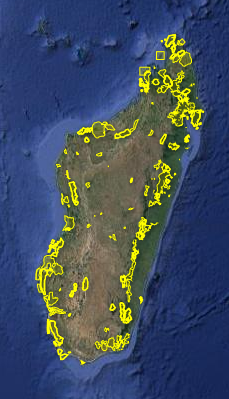 Protected Areas of Madagascar. Following the dramatic increase in the Protected Area Network in Madagascar, and the publication scheduled for early 2019 of "Les aires protégées terrestres de Madagascar : Leur histoire, description et biote / The terrestrial protected areas of Madagascar: Their history, description, and biota. ", we have worked towards updating data in the Madagascar Catalogue for the protected areas. We have placed special emphasis on the sites designated as KBA (Key Biodiversity Areas) by CEPT (The Critical Ecosystem Partnership Fund). We present as updated interaction map of the network, and an Index to the Protected Areas of Madagascar. 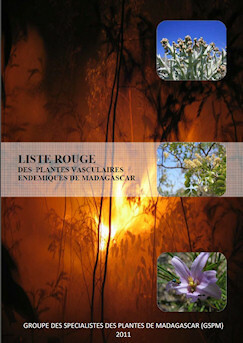 Publication of the Red List of Threatened Malagasy Plant Species. In conjunction with the Malagasy Plant Specialist Group of the IUCN, we have been undertaking Threat Analysis and Conservation Status evaluations of Malagasy Vascular plants. To date approximately 3,000 evaluation have been completed, and in May 2011 a first plant Red List for Madagascar was published. It includes 1,676 species assessed as Vulnerable, Endangered or Critically Endangered. Newly added or revised treatments for Madagascar (last updated - 25 March 2019). The extraordinary botanical diversity of inselbergs in Madagascar. Marina N. Rabarimanarivo, Brigitte Ramandimbisoa, Nivo H. Rakotoarivelo, Peter B. Phillipson, Sylvie Andriambololonera, Martin W. Callmander & Stefan Porembski. 2019. Candollea 74: 65-83. In this box we provide links to the most recently added species or newly treated plant taxa for Madagascar and other publications on the flora. More than 15,360 images of Malagasy plants currently available (May, 2012), including 11395 photos of living plants and with more being added regularly. MadCat is richly illustrated with photos and high resolution scans of specimens. See a selection of some of our favorite Malagasy plants but clicking on the image below (and find out what it is! ), or search using the Images link on the horizontal menu bar or use the Image Galleries links on the sidebar for more image search options. Links to images for all higher taxa are available on all Family and Order pages, see for example: Fabaceae or Lamiales. The Project Team - The project team comprises MBG staff based in St Louis, Princeton, Paris and Geneva, and staff of MBG's Madagascar Research and Conservation Program based in Antananarivo. Peter Phillipson, George Schatz or Sylvie Andriambololonera.